Don’t Trip: Running with Rifles | SPACE-BIFF! Many green men running. Running with rifles. (You may need to click for bigger. They're small men). I have two secret talents. One of them is that I can fall asleep anywhere and anywhen. The other is that I’m pretty good at following through on my New Year’s Resolutions. I made three this year. Two of them are dull—you know, weight loss dull. But the exciting one is that I’ve determined that I’m going to update Space-Biff! with much more regularity. I’ve already got a bunch of great stuff planned for this and next month, and all I have to do is beat L.A. Noire, remember what happened twenty turns ago in the RPS Dominions 3 game, and contract another disease in Skyrim. Today was MLK Day, so I had all day free to work on these things. 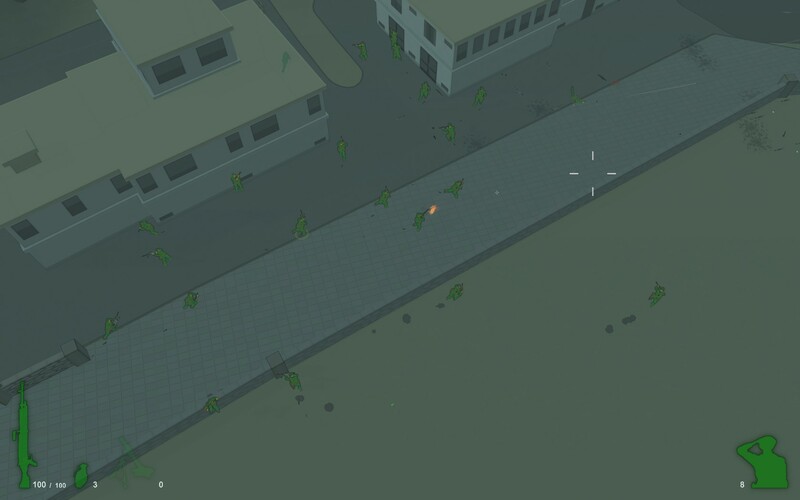 Instead I spent all day playing Running with Rifles by Modulaatio Games. Day wasted? I think not. The battle begins. Allen Perry is the little dude with the yellow ring around him, just left of center. Running with Rifles feels like the direct control feature from Men of War but smooth and all the time. It simulates large battles surprisingly convincingly, and is so easy to control that it only took a few minutes before I was effortlessly leading a small squad of men, clambering over obstacles, cowering under fire, and taking down convincing squads of enemy troops. In my first life I was Allen Perry (named after his father, I imagine). His army was green, the enemy’s grey. This naturally made them mortal enemies. He carried a G36 rifle, identical in every way to the enemy’s AK-47s. The goal was to take this town, an elongated piece of work perfect for a protracted firefight over open but ultimately linear objectives. Allen boldly led a few men as far east as possible, getting through the town’s wooded park and reaching the central square. This was his greatest accomplishment—making sure the men got there before the fight got bogged down in that forest-within-a-city. He never even fired the rifle he was running with. Before he could, some grey had shot him dead. The town's central square by day. I'm the guy with the machinegun on the building at the left. I have just killed Joel Fischer. Allen’s death paved the way for my second life as Craig Bryant (he’s always resented his archaic first name. He left home over it, though he didn’t tell his parents that), a fine young soldier who lurked behind the stalemate at the central square long enough to grab an M240 machinegun. He then climbed a ladder up to the roof of a building overlooking the square, hoping to clear out enough greys to allow his fellow greens to push forward. It was a gallant effort, but the greys were able to cluster in the trees on their side of the concrete clearing. He survived a long time, long enough to wish that vehicles were implemented. 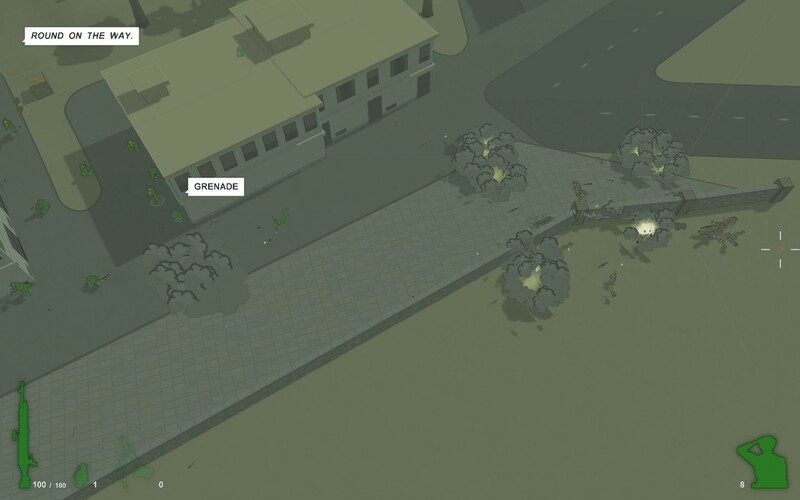 But this is version 0.572, and vehicles are a long way off according to the developers. Even so, it’s one of the best working betas I’ve ever played, and I’m still yet to try out multiplayer. 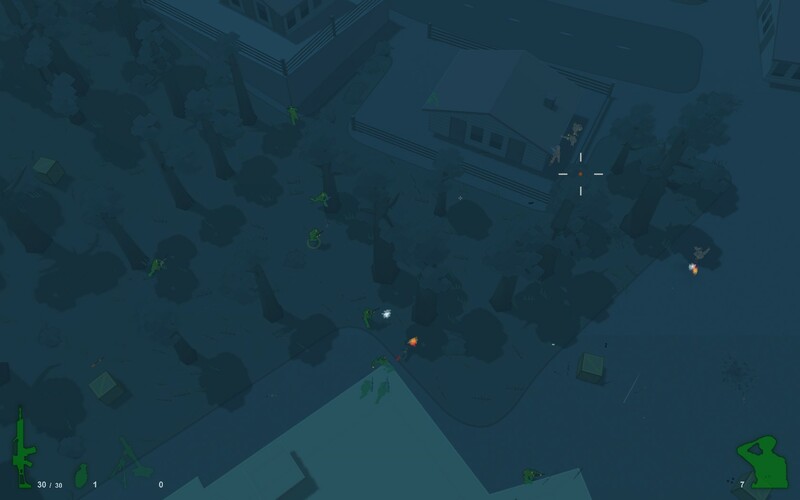 While thinking about multiplayer, Craig was thrown from his perch by a stray round. The same square once night falls. I've finally pushed up to take cover behind a box. This critical position might have helped us push up, but it did not. Joseph Kelly (he never even thinks about his name, even though people usually just call him “Kelly” like it was his first name) isn’t a very productive life for me. 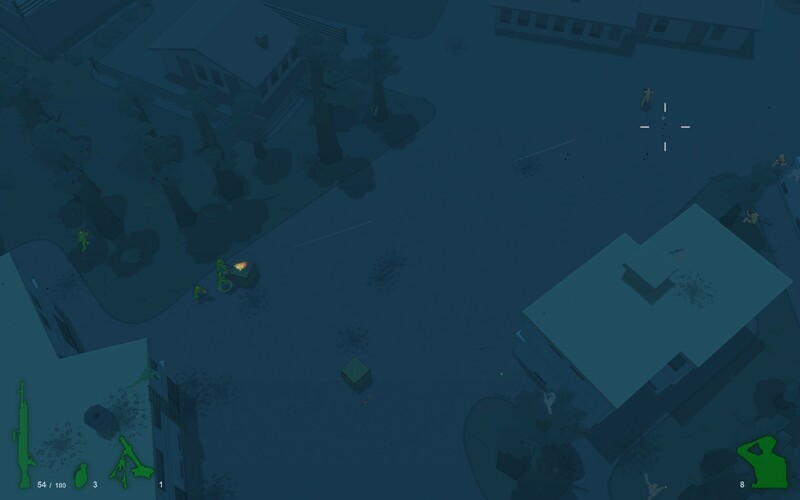 He crouch-waddles into the central square as night falls, but for every grey he guns down from his position behind an armored box, another two appear. This is the result of two factors. First, the AI is in beta along with the rest of the game. 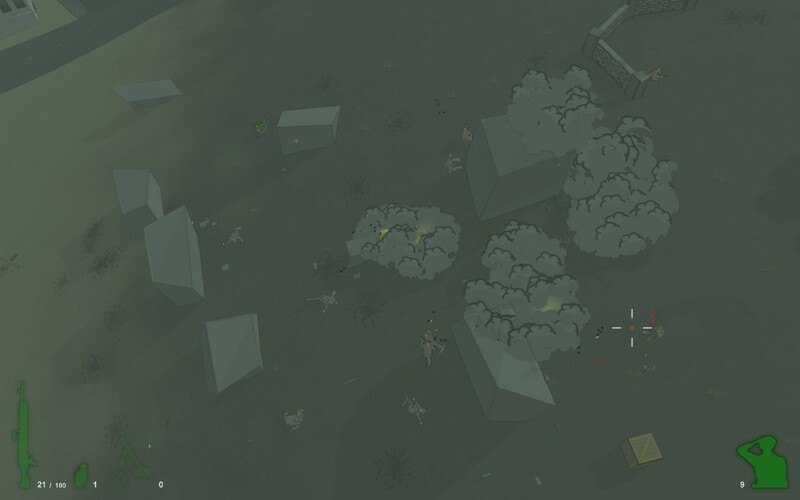 While the little computer soldiers do a surprisingly great job of simulating an actual hectic battle, and while they can and do act autonomously and far from your position, they tend to cluster near to where you are, creating stalemates unless you’re constantly on the move. This isn’t a bad thing. The second is that this is Map 2, which is much more compact and focused than Map 1. On this map, things tend to bottleneck. This also isn’t a bad thing. In fact, I’d go so far as to say it’s massively preferable to the massive sprawl of the other map, in which the “running” part of “Running with Rifles” can unfortunately become the focus of the game. Pushing along the southern edge of the town, with field/desert/prairie to the south. The problem: massive numbers of greys inbound. I’m not sure how Joseph Kelly died. I have a tendency to watch the reticule, not the soldier firing the gun, so once I realize that none of the greys that I’m aiming at are dying, and that my soldier isn’t responding to me hammering the reload key, I finally figure out that he’s probably been dead for a while. The text telling me to “PRESS SPACE TO CONTINUE!” confirms it. I’m traumatized for about half a second and then I’m Norman Hamilton (his mother thought Norman was a suitably unassuming name. She wanted neither heroics nor theatrics from a seventh child). This is the soldier who changed the course of the battle. Norman is smart enough to decide that the central square is a death-trap. At least it was for Allen Perry, Craig Bryant, and Joseph Kelly, to whom Norman feels a strange bond. He contemplates reincarnation while he runs away from the battle, leading a group of men south to the edge of town. This proves an effective route, as the greys are reinforcing by moving into town across an open prairie, so once Norman has dropped a mortar on their main forces, it’s an easy task to take cover by the road and pick them off. Soon, the battle to the north is resolved as grey reinforcements no longer reach the contested central square. Soon a fourth of the map has shifted from grey to green control, and the greens are given the order to assault the grey’s last stronghold: the farm just outside of town to the east. Sadly, Norman Hamilton is killed while trying to flank the farm by cutting around to the north and then climbing a fence rather than making a frontal attack. About eight more of my lives end the the same way, with flanking seeming an impossible task. Finally, I play as Stanley Washington (this would have been a heroic and fitting name for Stanley. But he isn’t American, so “Washington” doesn’t hold meaning), and I decide on joining the frontal assault that’s currently chewing up the bulk of the green army. The slope leading up to the farm, populated with fortunate but improbable cover. The grey army clings to their final base, cutting up any greens who come near. 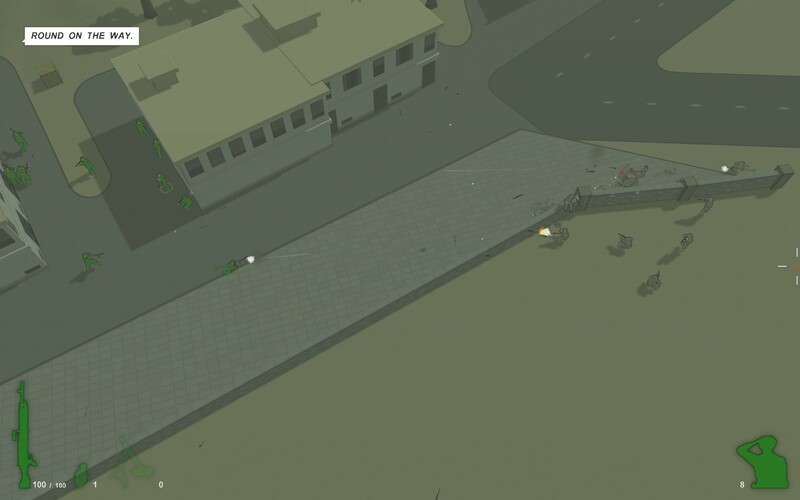 I realize this is the second mortar strike I've shown, but trust me, this never gets old. I’m not entirely sure how reinforcing works, but once an area is contested, it seems that troops can’t spawn there anymore. In any case, the farm was basically finished once this skirmish wrapped up. 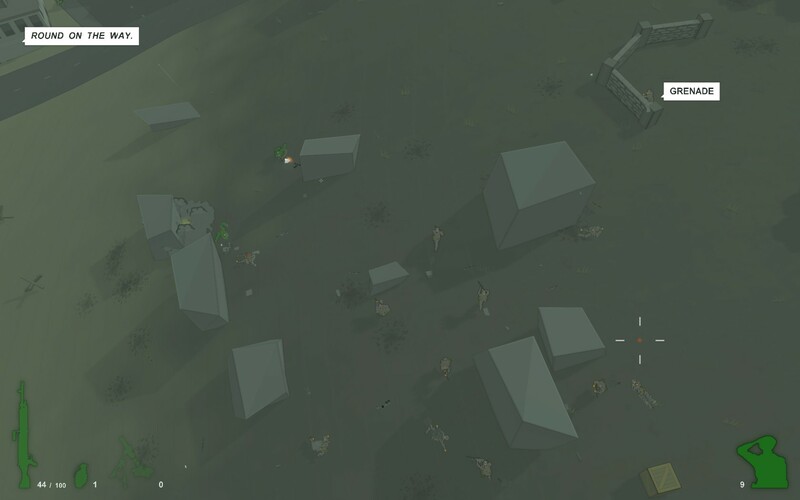 Stanley dropped the mortar, shot a couple survivors (AI troops become appropriately panicked when explosives make an appearance), and then nervously trotted up to the farm to find that the greys were depleted. The match was won! There isn’t any post-game stats screen, which is a shame because I’d love to see how ineffective I was with the silenced MP5. Of course, a post-game stats screen is a lot to ask when there isn’t even a proper victory screen, or even a fade to black. Once victory was announced, Stanley decided to see if there was anything across the prairie to the south (there wasn’t). He eventually grew so bored he took to tossing grenades at his allies. Again, Running with Rifles is distinctly not finished. It’s in beta, and though I’d sworn off betas earlier this year owing to the fact that I played hours of Space Pirates and Zombies in beta but have almost ignored it post-release, this is one that I’m glad to have tried out. There’s both a demo and paid version on their website. If you’re interested in sound and fury, I’d suggest you check it out. 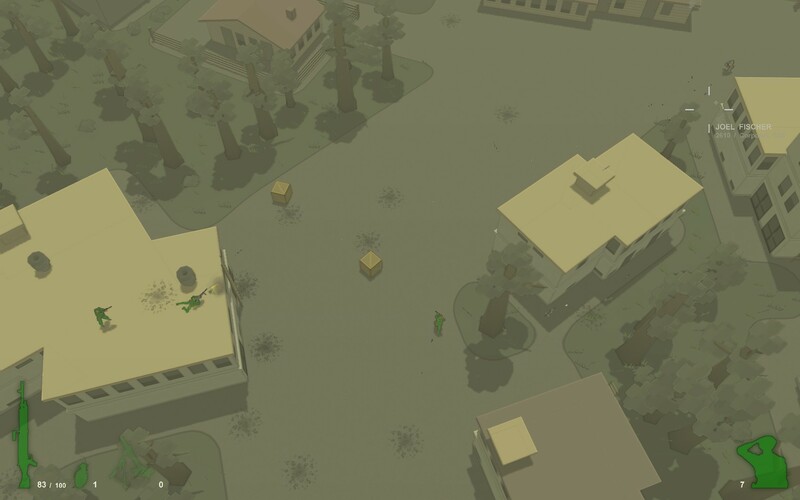 Posted on January 17, 2012, in Indie and tagged Indie, Modulaatio Games, Running with Rifles. Bookmark the permalink. 5 Comments. Nice review for a very nice game (especially multiplayer)! That’s precisely my next priority. I’ll probably be roping a few friends into this one sometime later this week! Funny Dan should write about running with rifles. He runs a lot with rifles too. On second thoughts, I’ll take your word for it.